Climatrol offers factory-authorized installation of exceptional-quality air conditioning systems from Lennox and York. Since our locally-based, family owned and operated company was founded in 1969, we have learned which companies manufacture the best and most reliable equipment, and are pleased to provide our valued customers with equipment from only those companies that share the same commitment to exceptional quality that we bring to our valued customers. If your residential or commercial equipment requires replacement, or you are interested in learning more about how a new air conditioning system can improve your comfort and overall life quality, contact us. We are a proud local contractor serving Clarksburg, Bridgeport, and surrounding areas in West Virginia. Is Your Central Air Conditioning Unit Broken or Experiencing a Problem? If your central AC unit is failing to provide adequately cooled air, is operating inefficiently, won’t operate, is delivering warm air, cycling on and off repeatedly, is unable to maintain a consistent humidity level, blowing dust, or is exhibiting any other signs of impending failure such as loud noises or unusual odors, contact Climatrol right away. We service all major brands of air conditioning and cooling equipment. The sooner you contact us, the faster we will be able to diagnose and repair the problem. If your equipment is more than 20 years old, it may be more cost efficient to replace your unit with a newer and much more efficient model. Financing is available for qualified buyers. If your AC system is experiencing a leak or has already lost a significant quantity of refrigerant, you should not attempt to correct the situation yourself or without the assistance of a licensed professional. The cooling technicians at Climatrol Inc. are trained and licensed to properly recharge and repair leaks safely and according to universal code for your protection and to maintain the integrity of your system. If your system is blowing warm air, has frost built up around the cooling tank, has a sticky cover plate, frozen evaporator coil, or condensation, it requires service as soon as possible. If your unit is leaking, simply adding more refrigerant will only add to your repair expense and will not solve the issue. We have the professional-grade leak detection equipment necessary to locate and repair the area correctly. Contact Climatrol to schedule a consultation to determine your home or business cooling needs, request a repair quote, or schedule a maintenance service. 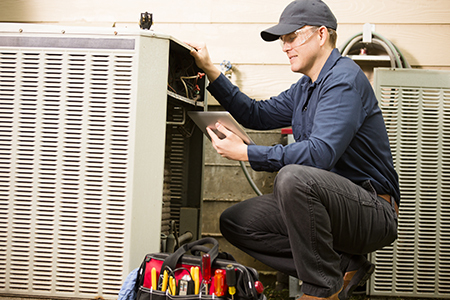 To maximize energy efficiency, your cooling system should be professionally maintained at least once per year. Our friendly office staff can be reached at: (304) 623-0606.